1 * 3 Rotating Heads LED Motion Sensor Light. 1.Turn power OFF before installing or servicing. 2.Do NOT touch or install fixture while in contact with standing water. 3.Do NOT remove the protective LED lens. 4.Do NOT look directly at lighted LEDs for any length of time. 5.Do NOT leave bare wires exposed outside the wall canopy enclosure. 7.Suitable for wall or eave mounting onto recessed or round surface mounted electrical boxes rated. Not suitable for ground mount electrical boxes. 8.Do NOT allow the sensor head to touch the LED head housing.Keep space between the LED heads and the sensor head. 9.For proper operation and protection against water damage,the motion sensor adjustment controls MUST be facing downward. 10.Do NOT mount below 5ft. 1.Turn OFF power to work area at main circuit breaker or fuse box. CAUTION:Do not reply on wall switch alone to turn off power. with two long machine screws(B).Ensure that the screw thread on the center hole is pointing away from the surfuce. openings in the gasket and adhere the gasket to the crossbar and outer edge of the round surfce mount electrical box. NIGHT SAFETY - LED Motion Sensor Lights, certified by the US ETL, can be 180° rotation sensing angle and maximum sensing range of 12M/39FT. The human body's infrared sensor switch, perfect sensitivity provides a safer protection for night safety. HIGH BRIGHTNESS & ENERGY SAVING - The lamp holder is die-casted with aluminum alloy material, with 66 LED 2835 high-brightness chips, power is 42W±10%, 3000LM, color temperature 6000K-6500K; guarantees stable output & heat dissipation, saves about 85% of the electricity bill. I believe you will like it! IP65 WATERPROOF - Up to IP65 waterproof design ensures safety and stability when outdoors. If the wind and rain are too strong, please take protective measures. Fit for garages, yards, entrance passages, etc. SETTING MODE - 3 adjustable modes (30S setting, 60S design, 120S setting) + 1 long light mode (off sensing, keep constantly bright), 4 adjustable modes.Intelligent choice. INSTALLATION INSTRUCTIONS - Refer to the description below and the product manuals provided by us for specific installation instructions. 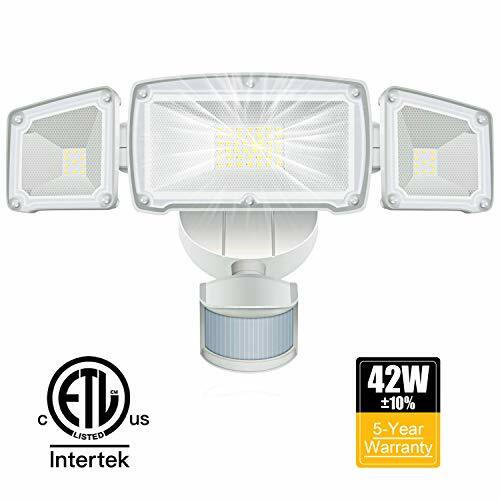 Package includes: 1 * 3 Rotating Heads LED Motion Sensor Light + English Manual + Install Accessories. If you have any questions about this product by TOPNEW, contact us by completing and submitting the form below. If you are looking for a specif part number, please include it with your message.